Rezidor has revealed the opening of Radisson RED in Brussels, Belgium, marking the debut of the brand. Radisson RED is a new hotel philosophy and lifestyle brand that reflects the ageless millennial mind-set. Inspired by art, music and fashion, this brand is driven by bold design and breaks the traditional hotel model. “Radisson RED is Carlson Rezidor’s new lifestyle select brand inspired by the ageless millennial mind-set. “It boasts a forward-thinking design and offers a new guest experience fuelled by personal interaction and personal choice. “It is a true recognition of the increasingly important role that technology plays in facilitating the best of everyday life – home or away,” said Wolfgang Neumann, president, The Rezidor Hotel Group. “Today is a great day for us! We are tremendously proud to open the very first Radisson RED hotel in Brussels, Belgium. The new hotel brand is designed to appeal to tech-savvy guests with an ageless millennial mind-set by offering a non-traditional experience. Radisson RED is created for millennial travellers, who are thrill-seekers and have an outspoken desire for immediate gratification. The RED Creatives (the hotel team) – all recruited through social media – are big on personality and service and naturally understand what drives travellers with a millennial mind-set. The hotel does not have a front desk. 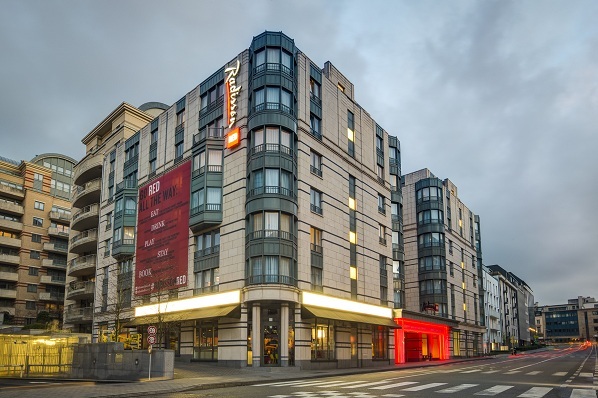 Radisson RED Brussels is right at the heart of Brussels and within walking distance of the European parliament. Its 149-studios have large window and feature a comfortable RED bed, fabulous 55” TV and sound bar, a picnic table, a fridge, just enough closet space, love yourself lighting and a spacious bathroom with a walk-in shower with great pressure, and feel special amenities.